Considering this year’s Pixar release is a sequel to their worst flick, Cars, I am putting my money on Rango being the best animated film of 2011. 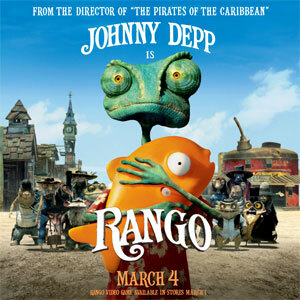 From Gore Verbinski, director of the first three Pirates of the Caribbean movies, comes Rango, featuring Johnny Depp in an original animated comedy-adventure that takes moviegoers for a hilarious and heartfelt walk in the Wild West. The story follows the comical, transformative journey of Rango (Depp), a sheltered chameleon living as an ordinary family pet, while facing a major identity crisis. After all, how high can you aim when your whole purpose in life is to blend in? When Rango accidentally winds up in the gritty, gun-slinging town of Dirt – a lawless outpost populated by the desert’s most wily and whimsical creatures – the less-than-courageous lizard suddenly finds he stands out. Welcomed as the last hope the town has been waiting for, new Sheriff Rango is forced to play his new role to the hilt … until, in a blaze of action-packed situations and encounters with outrageous characters, Rango starts to become the hero he once only pretended to be. With a cast that includes Depp, Isla Fisher (Definitely, Maybe), Abigail Breslin (Kit Kittredge: American Girl), Alfred Molina (Spider-Man 2), Bill Nighy (Harry Potter and the Deathly Hallows: Part 1), Harry Dean Stanton (Fear and Loathing in Las Vegas), Ray Winstone (Beowulf), Ned Beatty (Toy Story 3), Stephen Root (Office Space) and Timothy Olyphant (Justified) as the Spirit of the West, Rango is an exciting new twist on the classic Western legend of the outsider who saves a town – and himself in the process. You and your family are invited to a special advance screening of Rango on Tuesday, March 1st at 7PM in Sandy, Utah. In order to get your passes, simply click here and take the “Reel Place Rango Cast Trivia” (hopefully you paid close attention to the previous paragraph!). Upon getting seven or more trivia questions correct, you will be instructed how to print your passes. Rated PG for rude humor, language, action and smoking, Rango opens nationwide on March 4, 2011.